Four-color process printed on Side 1 of 14pt C1S Semi-Gloss stock. Coated with Aqueous Gloss. H1 business card slits on right pocket. Recipients may be surprised when they reach out to touch this design for The Libre Initiative and discover it's... smooth. Ink imprinted onto the stock makes it look like a cracked or scaled texture, similar to snakeskin, for a memorable first impression. 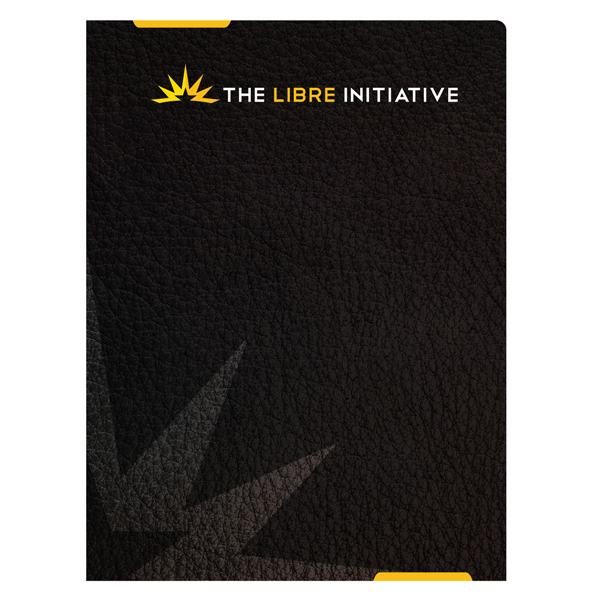 The Hispanic-focused political organization highlights the word "Libre" to match the yellow sunburst logo. A gray, partial logo in the bottom corner actually overlaps both covers. When open, the design shows a giant sunburst to suggest rising and upward mobility. 1 foil stamped area and 1 embossed area on Side 1 of uncoated 100lb Sterling Gray Linen stock. C1 business card slits on right pocket. 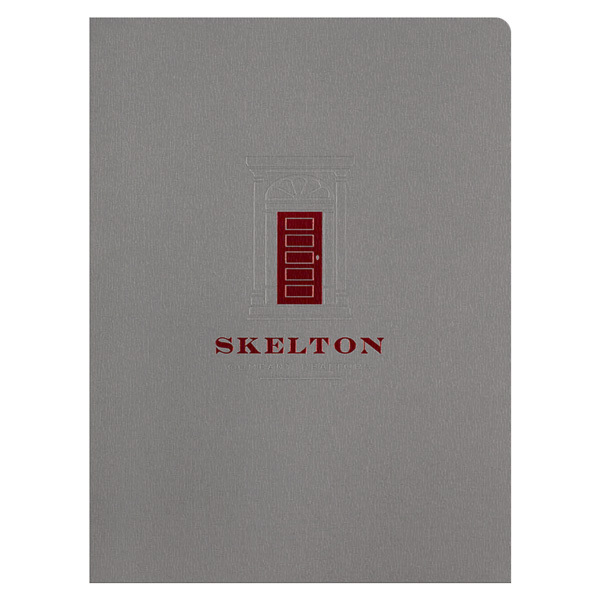 Skelton Company Realtors embossed its logo onto linen stock for a classic style. The logo depicts an ornate door to suggest selling or purchasing a home. The raised emboss, smooth Metallic Apple foil, and rough linen stock contrast each other to create a unique sensory experience. The red and gray colors salute Skelton's hometown team, the Louisville Cardinals. Both sides printed with four-color process on 130lb C2S White Dull stock. Coated with Aqueous Matte. Two sets of H4 business card slits on right pocket. 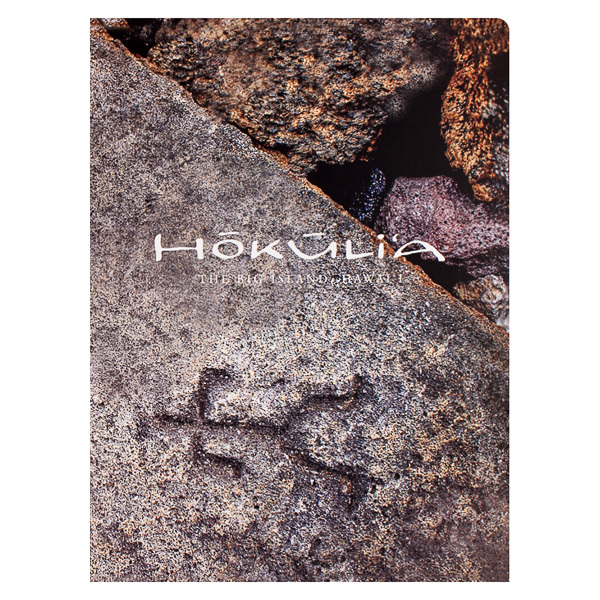 Visitors will get to see a piece of Hawaiian history at Hokuli’a as shown by the petroglyph on the cover. The community's logo is displayed above the prehistoric drawing in a fun, exotic font. A true symbol of island life—the palm tree—is featured inside, showing what visitors might see as they lay on the beach and look up at the clear sky. The stone image from the cover continues on the pockets. Another petroglyph is featured on the back to continue the cultural theme. Side 1 printed with 3 PMS colors using heavy coverage. Side 2 printed with 1 PMS color using heavy coverage. 14pt C2S Semi-Gloss stock coated in Spot UV with overall matte finish. H2 business card slits on left pocket. 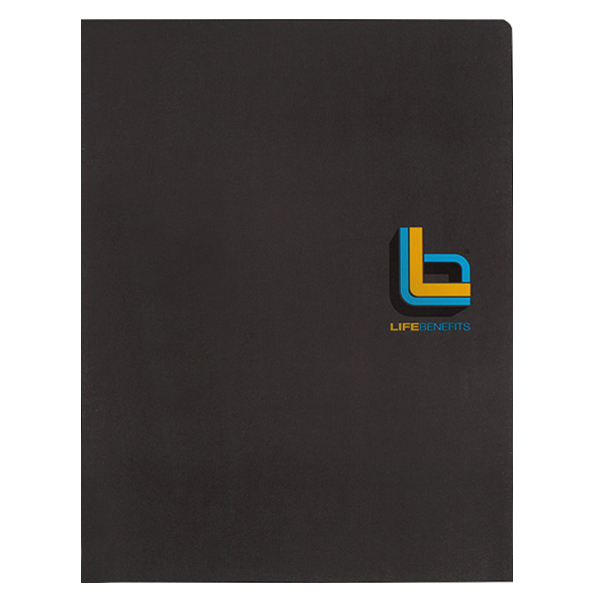 Life Benefits' blue and yellow logo sits at center right, where users place their thumb to open the cover. This positioning lets the monogram act as an introduction to the design's contents. Yellow panels set a happy, carefree tone for purchasers of Life Benefits' insurance solutions. Spot coating on the right pocket reveals the company name under certain light. Blue and yellow stripes are repeated on the back cover as one last reminder of the brand's identity. Smooth round corners look classy—and pull double duty as a protective agent. Because of their curved shape, they're resistant to fraying or dog-earing. Round corners' stylish die-cut stands out in a crowd and gives your design a modern look. Two interior pockets hold 8 1/2" x 11" print media, including letter-size papers, pamphlets, or stepped inserts. Both pockets are cut in a v-split style to prevent buckling when opening and closing the covers. Customize the pockets with brand information, or carry over a design from the front.